Anthony Haslage is a Business Administration student with an overall 3.0 GPA and a 4.0 GPA in Accounting. 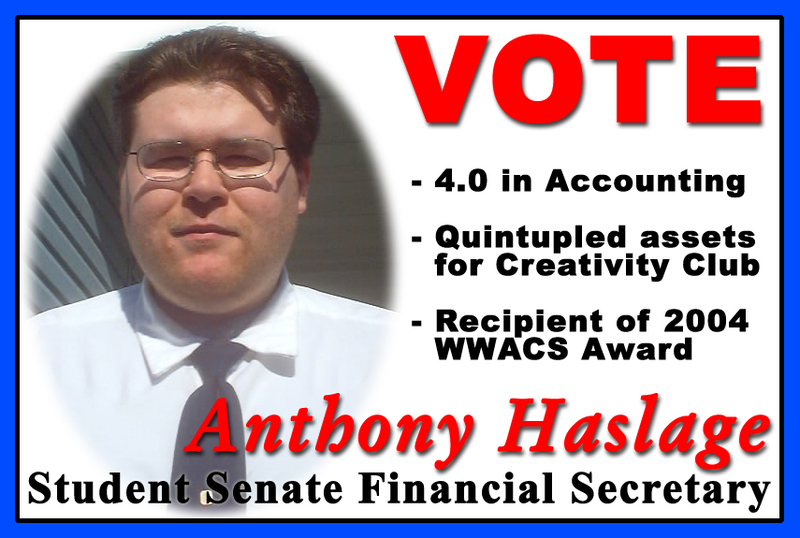 Anthony Haslage was formally both a city of Lorain Ward 6 City Council and Student Senate Presidential candidate. Anthony Haslage conceptualized LCCC Radio: The Duck. Anthony Haslage is a former writer/editor of the Collegian and created the Club Cache feature. Anthony Haslage is the writer/host of the Politically Crowded program currently airing on LCCC Radio: The Duck. Anthony Haslage currently organizes monthly community events at the Lorain Public Library South Branch. Anthony Haslage is the former Financial Secretary of the Radio Club and is the current President of the Creativity Club, quintupling the club’s assets. Anthony Haslage is a recipient of the “Who’s Who Among College Students in America Junior Colleges” award in 2004. Thank you all who voted for me, I won! Sp 2003 to Sp 2005 – Organizes monthly community events at the Lorain Public Library South Branch. Sp 2004 to Sp 2005 – President of the Creativity Club. Quintupled club’s assets. Fa 2004 – Recipient of the “Who’s Who Among College Students in America Junior Colleges” Award. As an exclusive feature to this web site, I figured I should give you, the voters, a little bit of enlightenment towards what I would like to do once in office. Below are a few ideas I have had over the years and obviously being in Student Senate is being part of a team, so while I can not guarantee everything I want to do will work for the entire Student Senate, I will try my best to promote these ideas. Perhaps the newest thing on my list is to convince students, staff and faculty to conserve energy. Every day on my way to and from class I see between two and four rooms that waste electricity by leaving the lights on after class is over. By turning off the power it would save the college money and the college would pass the savings on to the students by not raising the tuition as often or as much. I would be open to the ideas of others and those who come up with ideas we use will receive credit. I am not sure in what manner, could be anything from some name recognition to items of interest. I think there should be a memorial to students active in school activities beyond just attending class. There are students who have done a lot for the school and have died tragically and received little recognition for their efforts. Those of us who move on can always get a diploma or recommendation, those who can not should be externalized. A method should be created to involve more students in Student Life. Only one-percent of the student body get involved in the smallest of activities. Most students do not seem to know of the dances, free meals and such that are available from time to time. Not to forget mentioning the organizations for those with specific interests. As a person that has accounting experience under his belt, I would go through the Student Senate financial records and reorganize them. Then, once reorganization is complete, ensure that proper and accurate journals and ledgers are kept from then on. I would then educate the student body with any information they need to know that can benefit them and the organizations they represent. This means learning to file for grants to assist with fundraising. And of course, as Financial Secretary, I would come up with various activities of a fundraising nature that could both assist organizations in making capital as well as considering local charities to receive a portion of the financial efforts. I have a three page plan laid out with many more ideas, some so big they could affect how the entire campus operates and others which are simply tweaks to procedures and policies. In the general scope of things, the Student Senate is very low on the chain of command, but if you know me, you will find I do not easily take NO for an answer. I will investigate every little thing to the point where there is no denying the facts. In the case I may be wrong, I am capable of admitting such.